The Division of Endocrinology is staffed by internationally renowned physicians in the fields of thyroid and metabolic bone disorders, who are devoted to caring for patients and to evaluating, managing, and researching a multitude of endocrine disorders. These include thyroid abnormalities, bone and calcium metabolism, disorders of growth hormone, complications of menopause, hirsutism, polycystic ovary, hypogonadism, sexual dysfunction, infertility, lipid metabolism, endocrine hypertension, adrenal, and pituitary disorders. Adrenal vein catheterizations can be done as part of the work up for the evaluation of primary aldosteronism. These are done under the direction of an endocrinologist and are performed at Boston Medical Center’s Interventional Radiology department by skilled radiologists. The Bone Health Care Clinic focuses on the prevention and treatment of osteoporosis along with other metabolic bone disorders, including rickets, osteomalacia, hypoparathyroidism, hyperparathyroidism, oncogenic osteomalacia, and acquired and inherited disorders of calcium, vitamin D, phosphate, bone metabolism, and ehlers-danlos syndrome. The clinic’s state-of-the-art scanning equipment uses very low dose x-ray and allows the staff to make an immediate assessment of a patient’s bone status. BMC’s adult diabetes program is recognized by the American Diabetes Association. Its mission is to improve health and quality of life for patients through diabetes management, education, support, advocacy, and research. Learn more here. Thyroid treatment at BMC is nationally recognized for both clinical and research excellence. 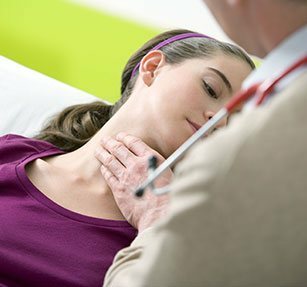 The faculty members are interested in all aspects of thyroid diseases, especially patients with hyper- and hypothyroidism, thyroid dysfunction during pregnancy, autoimmune thyroid disease, goiter, and benign and malignant thyroid nodules. The team specializes in thyroid ultrasound and fine needle aspiration biopsies, and in the use of radioactive iodine in the therapy of hyperthyroidism and thyroid cancer. Patients are seen in a timely manner after consultation requests. 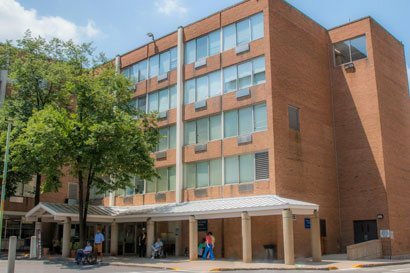 Availability of on-site thyroid biopsy, as well as bone densitometry and a phlebotomy lab, provide added convenience and reduce stress for patients.